Well, I am off to Paris. But before I go, I want to mention something that is puzzling me. 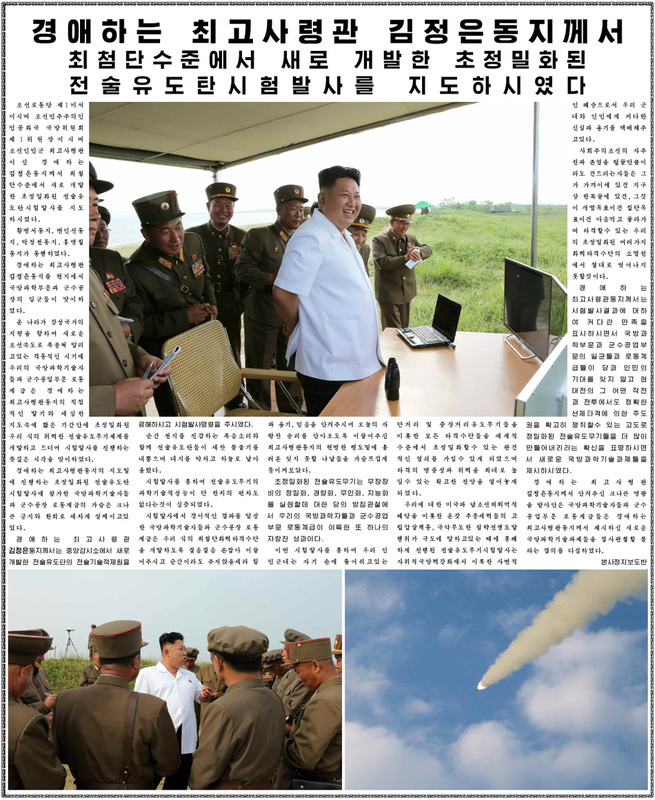 You undoubtedly noticed that Rodong Sinum (Korean|English) carried a story about Kim Jong Un attending test launches of “newly developed ultra-precision tactical guided missiles.” The story contained three not very helpful images. “Their range is some 190 kilometers, and we are now looking into exactly what type of rockets North Korea fired,” a JCS official said, noting that the North’s 300-millimeter multiple rocket launcher KN-09 has a similar range. Another news site quotes Yonhap quoting an official saying “Our analysis of its trajectory and other details led us to believe that what North Korea fired off yesterday was the 300-millimeter multiple-rocket launchers. 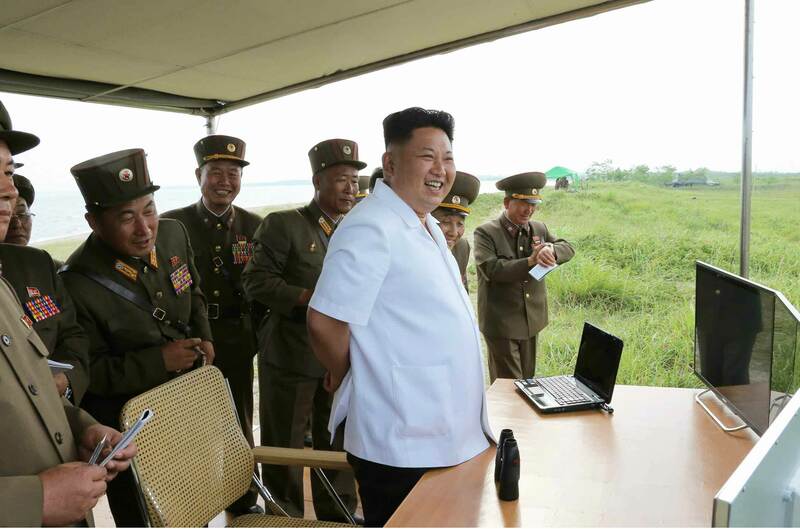 North Korea appears to test-fire them to extend its range further.” US officials were more circumspect, stating in public that they were “still evaluating the available information to identify the exact type of projectile” and privately telling Barbara Starr the rocket was not new. If the rocket really traveled 190 km, it is not a 300 mm artillery rocket. 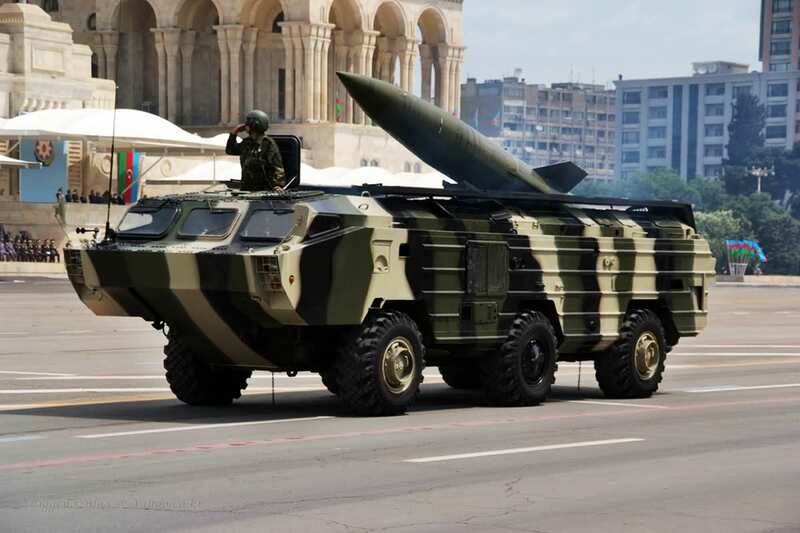 The natural comparisons for such a rocket, which North Korea is developing are the Russian BM-30 Smerch, a Chinese knock-off, or Pakistani Hatf IX/Nasr. All three of these systems have a range more like 60 km. On the other hand, a 600 mm missile like the US ATACMs or Russian SS-21 Tochka might reach that range. (The SS-21C tops out at 120 km, but it could be range-extended.) 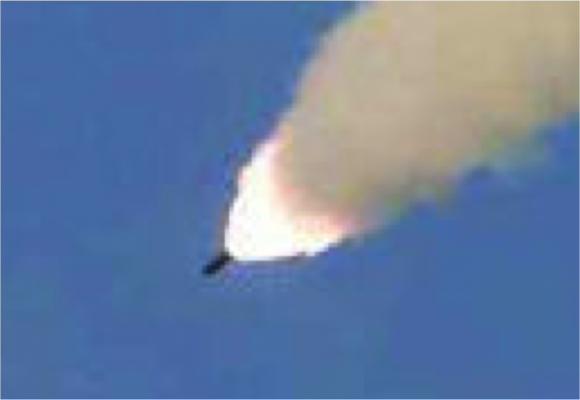 North Korea started testing and deploying an indigenous SS-21 in 2006 and 2007. Two leaked cables (NSFW!) contain the text of papers that the US circulated about MTCR members describing the missile as “a new solid propellant SRBM based on the SS-21 SRBM. This new missile — called the Toksa by the United States — has a range of 120 km with a payload as large as 500 kg.” (I think we are teasing them with Toksa/Tochka.) North Korea paraded the Toksa in 2012. The provenance of the Toksa is unclear. Dan Pinkston notes there are both reports suggesting either Russia or Syria is the source of North Korea’s SS-21s. Based on the images released by North Korea, we can tell the test involved a solid-fueled rocket– solid-fuels produce bright and smoky plumes like the one you see — but that’s all. Unfortunately, the image of the rocket is too blurry to determine whether it is a BM-30 or an SS-21. 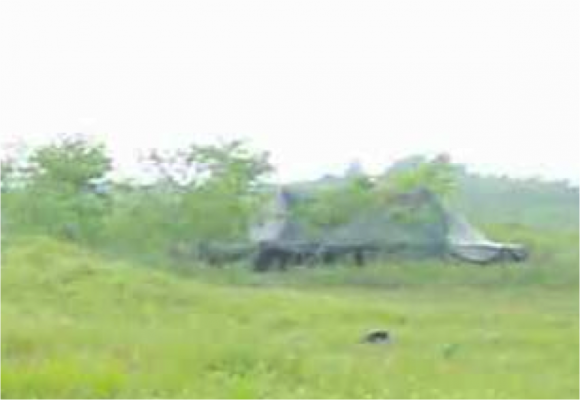 Also, one image contains what may be tarp-covered launchers in the background, but again they are too blurry to identify. At some level, it doesn’t matter. 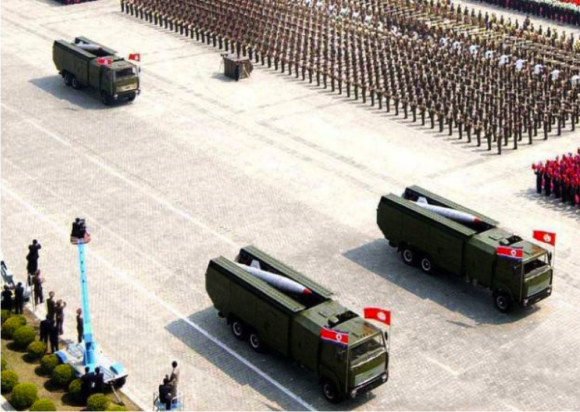 North Korea is developing both BM-30 and SS-21 clones, to say nothing of anti-ship cruise missiles like the Kh-35. It’s possible the range is “90-100” kilometers not 190 kilometers. Then it’s a Smerch. If its 190 km, then I think its more likely a Toksa. Sadly the employment situation among experienced analysts may not lead anyone to be publically supplying answers to your questions. The North Korean military may have test fired a new type of artillery rocket on its east coast recently, one with a long range that could be a substantial threat to South Korean. 300 mm and 190 km range does not seem completely impossible based on what a few other countries have developed. Wether North Korea has achieved that feat is of course hard to judge based on the available evidence. Throw in 100mm, not 300 mm, more and Chinese WS-2, WS-3 , SY-300 and SY-400 400mm guided missile reportedly have ranges of 200km to 280 km. India has the 420 mm Pragati/Prahaar with a range of 170 km. I was (at least implicitly) limiting myself to systems North Korea is believed to have access to–BM-30, SS-21, etc. But I did overlook the possibility of the unusual 302 mm WS-1 and Khaibar 302 rockets. Usually, the range is given as 100 km, although you are right that the WS-1B has a claimed range of 180 km. That’s worth looking into, although these are unguided, I believe. I excluded larger caliber rockets since the US and ROK say the new system is 300 mm. By space launcher standards that’s not that far into the solid motor performance envelope. Most MLRS rockets are pretty lousy (but cheap). If you pay, you get more, air drag notwithstanding. I am beginning to wonder if the rationale for paying more (for something like a WS-1B) isn’t a function of the artillery people competing with the new strategic rocket folks for influence. Maybe it is a 302 mm WS-1B. It could be competing with another arm of the military. Unguided MLRS type rockets are fin stabilized in flight and rail or tube stabilized out of the tube. There’s a transition zone where you’re not moving fast enough through the air for the fins to be fully effective, and the tube or rails run out, in which it tends to weathercock some into the apparent wind direction. Serious “amateur” rocket people see this all the time, where a rocket meant to go straight up ends up off some other direction shortly after leaving the rail. MLRS tend to see less extreme examples of that, but if you look at mass launches of unguided MLRS you tend to see a few. The traditional way to overcome that was accelerate faster, to reduce the time it’s exposed to weathercocking. Which makes for higher rocket chamber pressure and thicker motor casings, and weight. You can overcome that with active guidance. Which is entirely possible, but adds both failure modes and a lot of cost. Or did add a lot of cost, now good MEMS gyros are only slightly more than a dime a dozen (literally), though actuators on fins or steering rockets or the like are nontrivially added costs and complexities. Things like the V2, Scud, etc all take off like fast rocket launch vehicles, with usually vertical takeoff, a complex pitchover, active guidance from liftoff and careful thrust termination once you’re on desired trajectory and the like. They’re much more of the way towards a space launch rocket or a ICBM.